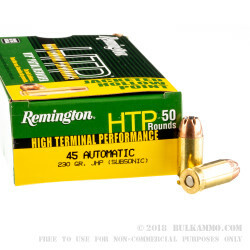 Whether you’re gearing up for the zombie apocalypse or just looking to get a lot of practice for self defense with your .45 ACP pistol, this case of 500 jacketed hollow point rounds from Remington is perfect for you. 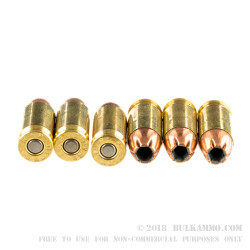 This subsonic load uses a 230 grain jacketed hollow point bullet and leaves the muzzle at 835 feet per second, typical for .45 Auto projectiles. 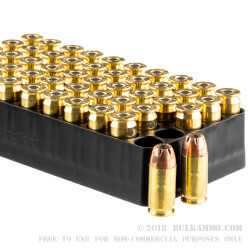 Each case contains 10 boxes with 50 rounds apiece, and each round uses Boxer-primed reloadable brass casings. The Remington Arms Company’s ammunition plant in Lonoke, Arkansas produces a wide variety of ammo ranging from shotshells to hollow points and frangible rounds. Remington also produces world-famous shotguns and rifles at plants in New York and Kentucky such as the 870 pump action shotgun and the Remington 700 long range rifle. The company’s main headquarters is located in Rockingham County, North Carolina. Q: I see no reviews of this ammo, is there any quality issues with this ammo? A: Hello Ed, These 230gr. JHP rounds by Remington in .45 ACP are excellent rounds. They should function great in your .45 ACP firearm. These rounds are very good for target and defense. Q: Does subsonic mean it's a slower round? Less powder? A: Hello Bill, Subsonic rounds are rounds that travel below the speed of sound. The amount of powder in the case depends on several factors, including the weight of the projectile. These 230gr. 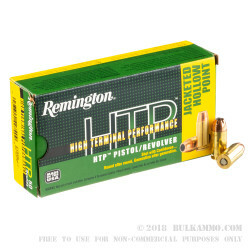 JHP rounds by Remington in .45 ACP make excellent target and defense rounds for your .45 ACP firearm.